Making things healthier for our family is a major goal in our house. We do not bake sweets too often because of extra sugar in these items. In addition to this, my mother and TechyDad’s mother are diabetic. We try to watch things because we know diabetes is in our genes. I was recently asked by Mom Central to participate in a Splenda tour to receive a free sample of Granulated Splenda No Calorie Sweetner and the Splenda Tastebook. I agreed since it was a fabulous opporunity to have some recipes to try with my family and friends that are diabetic and/or trying to watch their sugar intake. We had Splenda packets in the house before this, but had never really used it for anything beyond adding to drinks. Splenda recently teamed up with celebrity Mom chef, Katie Brown, to offer recipes and tips on how to use Splenda in more items than you can imagine. Brown offers recipes for cookies, cakes, breaks and even smoothies. Our sample and cook book arrived just before Passover . We wanted to try something quick and easy that did not require baking. TechyDad mentioned that we had a lot of overly ripe bananas. I opened up the Splenda Tastebook and found the Banana Strawberry Shake. It was the perfect fit since we had strawberries in the freezer. 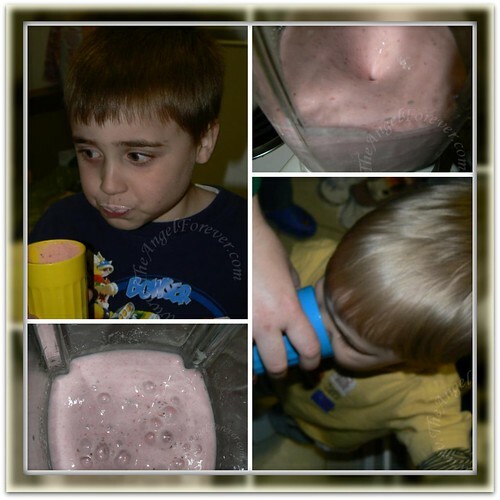 Bananas, strawberries, Splenda and fat free milk was all we needed with our handy dandy blender. If you are interested in the recipe you can find it here. One item that I especially liked was the nutritional information was included – big kuddos for that! As you an see below, both of my boys loved it. My little guy actually drank a lot and told us he now likes strawberries. We liked it SO much that TechyDad and the boys actually made three batches of this for the entire family for a snack. It was delicious! When Passover is over, there are a bunch of other items that look really good including the Chocolate Chip Pumpkin Bars. I will also be looking at other items to add to my online cookbook to make for my son’s party to bring special for the diabetic members of the family present. I know I have a lot of options with the online recipes and ones in my Tastebook thanks to Katie Brown who included not only drinks, desserts, but also side dishes, sauces, salads and salsas. 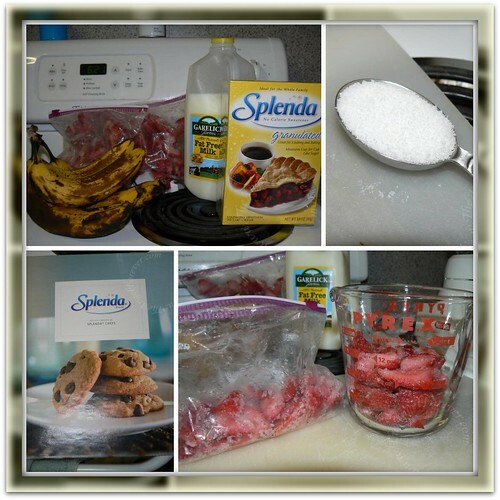 Have you used Splenda in any recipes that you liked? Please share, I would love to know. Disclosure: I wrote this review while participating in a blog tour campaign by Mom Central on behalf of Splenda and received products necessary to facilitate my candid review. In addition, a donation was made in my name to the Meals on Wheels organization to thank me for taking the time to participate. Why not use Agave Nectar instead of Splenda? It’s a completely NATURAL solution, and it’s sweeter than sugar. Best of all, I did some research and found that it is also safe for Diabetics. It ranges from 27-38 on the Glycemic Index (Depending on the Purity of the brand you get), and Diabetics just need less than 55 for it to be safe for them. Maybe that will help? It’s not even too expensive either, you can get like, a litre and a half for about 10 bucks at Cosco! .-= Andrew´s last blog ..Mar 30, Sugar Free Banana Pudding =-.